Olympus SLR fans who've clamored for the return of the classic match-needle metering OM-1 of 1976 (not possible due to worn out tools and dies) or hankered for a less expensive, basic-featured, manual-metering alternative to the exquisite but pricey OM-4Ti and OM-3, have finally gotten their wishes fulfilled. Unlike the single-digit OMs, the new OM2000 is no titanium-clad jewel with interated, off-the-film and/or shutter-curtain multispot metering and TTL flash capability, but it is a very pleasant, match-diode metering, manual-focus SLR that offers spotmetering and accepts all OM-series Olympus lenses. 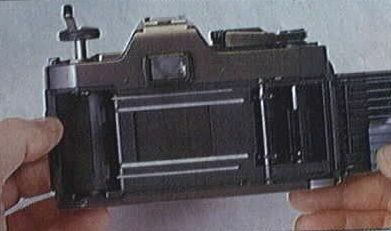 It can also be sold for considerably less than the top-tier OM's since it is made in Japan to Olympus's specifications by Cosina, which has furnished the same basic body to other makers as in, for example, the Nikon FM10 (not officially imported), the Ricoh KR-5 (available over the years in various model designations), and the long-discontinued Canon T60. In short, the OM2000 is aimed at OM users who need a second or third body, and at students, typos, and everyone who wants to get into the OM lens system without breaking the bank. 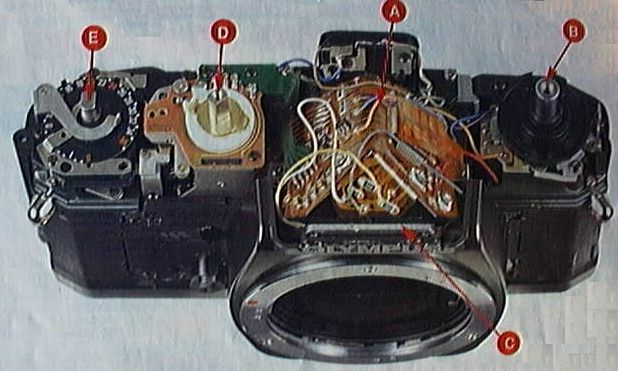 Aside from the lens mount, the body bears no resemblance to any other OM-series cameras past or present, nor are the controls similar. The OM2000 makes a very good first impression. While it's a bit larger than other OM series camera, it's attractively styled and beautifully finished in dark gray and black. It's body, a cast metal-alloy chassis with polycarbonate back and outer body panels, is reasonably light, but heavy enough to impart a solid feel. It has a real all glass pentaprism. The built-in grip and thumb-rest are very comfortable and those parts that come in contact with your fingers are finished in a smooth but grippy material that almost feels rubberized but isn't. As you'd expect with a very traditional, mostly-mechanical machine, all controls are just where you'd want to find them and well placed for facile operation. We especially liked the feel of the single-stroke-only wind lever, and the smooth, predictable shutter release. If you're a veteran SLR 8 loading and shooting with 8 OM2000 will give you a case of instant nostalgia because the entire process is just as it was back around 1970! There is no autowind or -rewind, no auto DX'ed film speeds, and no easy loading system. 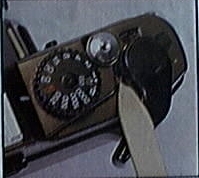 You pull up the rewind knob to insert the cartridge, insert the film leader into the slotted take-up spool, turn the rewind knob clockwise until you feel tension so you can observe it turning counter-clockwise to vertify proper film transport, shoot three blank frames to move the self-zeroing frame counter from "S" (start) to "1," and set the films's ISO by lifting and turning the knurled outer rim of the proper digits appear in a tiny window near "B" setting. 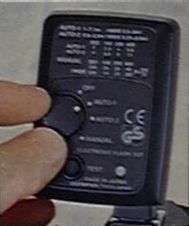 The self-timer is mechanical, there is no provision for adding a moter winder, and atop the rear of the pentaprism housing resides a plain, single-contact hot shot, which means no flash recycling or flash_OK signals in the finder, and you have to remember to set the shutter speed to 1/125 or slower when shooting flash pictures. 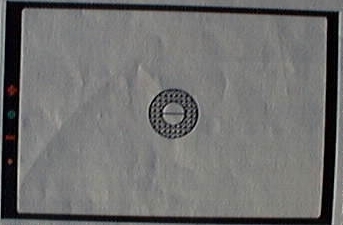 The match-LED metering by two EXP-76 or equvalant button cells that live in a little screw-cap compactment on the bottom. One small concession to modernity is a cartridge ID window built into the back. Despite its almost spartan simplicity, the OM2000 has a couple of feature sure to be appreciated by serious enthusiasts-- multi-exposure lever isn't the most convenient one we've ever used since you have to pull it back and hold it in place which stroking the wind lever (see Features At a glance on previous page), but you can repeat this process as many times as you wish to get any number of exposure on a single frame. The spotmetering swich to the left of the rewind knob stays putwhen you push it forward to spot postition, and a small orange LED lights up in the finder to warn you that you're in spotmetering mode. 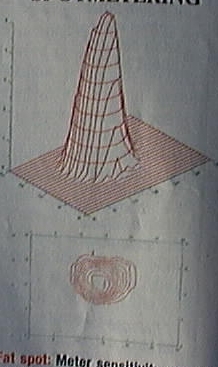 While our lab tests reveal that the actual zone ofspotmetering sensitivity extends well beyord the outer ring of the microprism circle that defines this area according to the instruction (see spot diagram to the right) the camera's spotmetering system still provides a useful alternative to the camera's broad-area center-weighted metering mode. While it doesn't deliver metering precision on a par with the 2-degree spot reading of the OM-4Ti or OM-3, we found it generally useful when metering from camera position in tricky lighting position such as backlit portraiture. Novices also are far less likely to get into trouble with a fat spot or partial metering system than with one that gives narrow-angle true spot readings. The OM2000's finder is very nice indeed. It'sreasonable bright, even with the standard 35-70mm f3.5-4.8 Zuiko zoom lens in place, and is quite contrasty, which aids focusing precision. 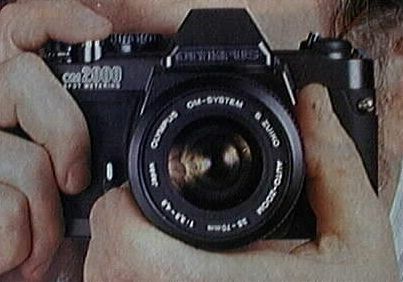 The central split-image rangefinder and microprism collar are large enough to be really useful and the entire finder field manually focuses well. The finder area plus adjacent LEDs can just about be seen in a single glance by eyeglass wearers. LED metering readouts have the obvious advantage of being easily visible in dim light and the three-LED system in the OM2000 --a red plus and minus sign with a green correct-exposure circle in the center -- is nicely set up to provide reading without excessive fussiness. In the lad, we found that the different between a "green circle along with red plus or minus reading was plus or minus one-third stops, respectively. 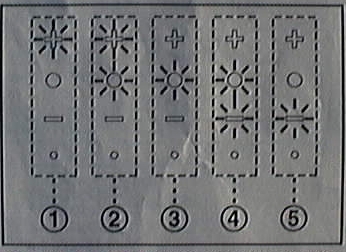 A red plus or minus alone indicates a setting that will give one or more stops of overexposure or underexposure, respectively. 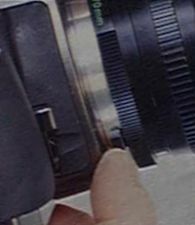 In pratical terms, exposure setting can be made almost as precisely as with the old match-needle system that used delicate precission micro-ammeters that camera makers report are no longer in production. 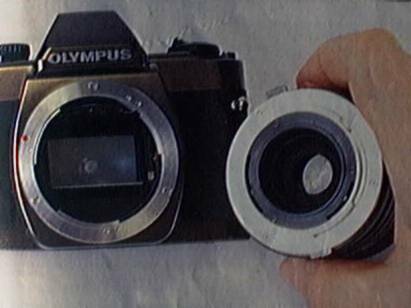 Although the OM2000 has no built-in flash, TTL capability or dedicated flash, Olympus does offer a nice compact unit for the camera. The shoe-mount S20 doesn't swivel or bounce, but this sleek two-AA-cell-powered unit has its head placed high enough to minimize redeye, provides two autoflash apertures, and has an ISO 100 guide number of 56 in feet. It covers the field of a 35mm lens and is claimed to cover lenses as wide as 24mm (at a reduced ISO 100 guide number of 28) with the included snap-on wide-angle diffuser panel place. In term of overall performance, the OM2000 acquitted itself admirably, providing a very high percentage of accurate exposure under a wide variety of shooting conditions. It handles very well, and , aside from having a somewhat noisy shutter, is a very pleasant camera to use. While it is devoid of bells and whistles and not really ungradable, it is a camera that should satisfy anyone who yearns for a simple, straight forward manual-focus SLR. The fact that it looks good, feels good, is reasonably priced, operable (albeit meterlessly) without battery power, and fits into the extensive OM lens system will certianly help to sell the OM2000, but what's even more important, those who buy it will br getting a fundamentally sound, well-engineered, durable camera. Viewfinder: Very bright and contrasty, brightness loss 1.9 stops. ).94X magnification is higher than any Olympus SLR we have tested; screen image is 86 percent of picture area, average coverage for this class of camera. Time Laspe: Time between pushing the release button and exposure: 205ms, normal for this class. Shutter speed: Speeds show variations typical of mechanically controlled focul-plane shutters, +- 1/4 stop between 1 and 1/2000 sec, but are well within specifications. Exposure accuracy: Shutter- and aperture-priority modes: Very accurate from EV2 to EV 17. 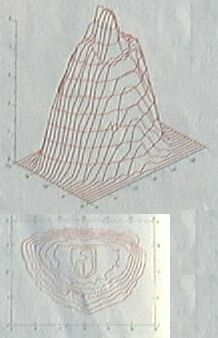 Sound level: (in decibels at 0.5m, center position): Single mode: 70.6 average, 93.0 peak, somewhat noisy.